I get a total "At the Mountains of Madness" vibe from this card, and it's a good thing in this case! I'm not sure how much of a cost returning exiled cards to their graveyard is going to turn out to be. On the one hand, there are decks that use their graveyard basically like a second hand, but you won't be playing against those every game. It also has some interesting dimensions for multiplayer and Commander, where you are likely to have more opponents with exiled cards to target, plus the ability to use the return ability politically to benefit someone you want to. 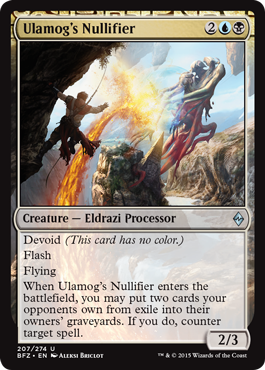 Today's card of the day is Ulamog's Nullifier which is a four mana Black and Blue 2/3 with Devoid, Flash, and Flying plus it can it can counter target spell by returning two opposing cards from exile to grave. This card requires some support to exile cards and both Blue and Black mana sources, keeping it more in line with Dimir or perhaps Esper, Grixis, or even Sultai designs. The creature itself is not bad, but not remarkable either and does work well as a surprise blocker against a 2/2 with Flying. The conditional counter is situational, but useful as it is attached to a creature for one mana over a Cancel. Timing both at the same time is unlikely unless the opponent makes an error during the attack step, so that weakens the card slightly. Overall this is a solid card with different potential applications and may see play in Standard or control decks in Modern. In Limited this is a very effective use of mana on the opponent's turn that can block or counter a spell then offer an evasive creature on the next turn. A great second pick in Booster that can be splashed if needed and a good bridge in Sealed if both Blue and Black appear strong.